Have you ever taken something that wasn't yours and thought, "it's no big deal?" Have you ever told a very little lie and thought, "it's no big deal?" Have you ever done something you knew was wrong and thought, "it's no big deal, no one saw me anyway?" "The person who sins is the one who will die. The child will not be punished for the parent’s sins, and the parent will not be punished for the child’s sins. Righteous people will be rewarded for their own righteous behaviour, and wicked people will be punished for their own wickedness." Meet Achan . . .
Achan committed a sin that led to the destruction of all his family members, his children and all his animals; they were burned by the people in his community. Achan thought it was not a big deal to take some items from his trip. He kept those items without the knowledge of anyone. Although Achan knew God's instructions with regards to this but he chose to disregard God's instructions. Does Achan's story connect with you in anyway? Have you ever taken away items from your hotel room back to your house? Or are there some of God's instructions or the laws of the land that you have chosen or planned to disregard? Consequences of our sins can affect those around us. Achan's sin led to the death of 36 soldiers in Israel, and it also led to the death of his children. No sins can be hidden forever. Your sins cannot be concealed from God. God knows everything about you even if others don't. Whoever conceals and continue in sins can never be successful (Proverbs 28:13). One’s life does not consist in the abundance of the things he or she possesses or the country that you reside (Luke 12:15). What seemed of great worth can eventually be worthless. Do not take any sins with levity. Even if those around you are praising you for your actions or perhaps you have not experienced the consequences of your wrong actions, do not mock God by thinking His mercy will triumph. God cannot tolerate sins (Habakkuk 1:13). Don't covet wrong things; real blessings come from God not through sins. There are consequences for every sin; everyone loses in the sin game. 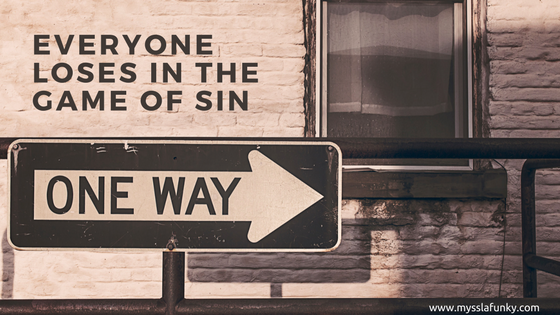 What sins are you overlooking in your life and in your home? Are there sins that you don't believe are important to God? Ask God to open your eyes to sins that you do not take seriously. Ask God for His mercy for every little and big sins that you have committed. Remember to confess, forsake and live a life that is pleasing to God. Are you ready to pay the price to live for God? As you go into this week, I'd like you to share this post with your friends or any group that you are part of on various social media platforms. See you next week Monday for another post from Myss Lafunky's blog. Sage will be writing the next two weeks' posts.